One tasty little Mini and Zuke is at full attention. The naturally delicious formula makes all the difference–quality protein, wholefood antioxidants, and a mouthwatering taste your dog will love. 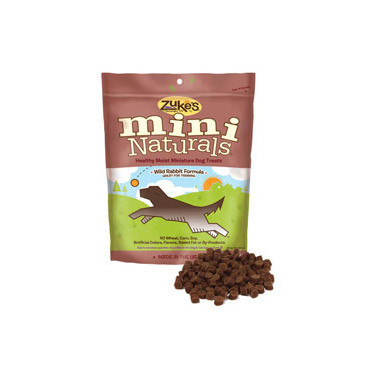 Feed Mini Naturals anytime as a healthy, natural treat for your dog. Wild New Zealand Rabbit, Ground Rice, Ground Barley, Malted Barley, Gelatin, Vegetable Glycerin, Tapioca, Brewers Yeast, Natural Flavors, Fish Oil, Lecithin, Salt, Phosphoric Acid (a natural acidifier), Sorbic Acid (a natural preservative), Mixed Tocopherols, Ascorbic Acid (Vitamin C). Free of wheat, corn, soy, artificial colours and flavours, added fat or by-products. My dog loves these! Awesome small treat so you can give them a few or many. My guy has allergies, but loves the rabbit treats!